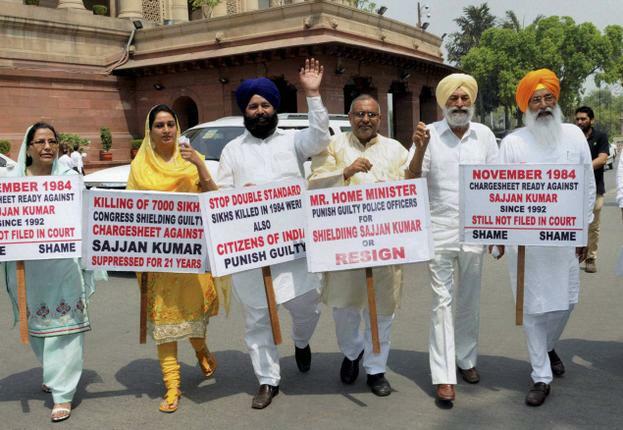 Call this miscarriage of justice or benefit of doubt given to the scoundrel or plain political foul play, the latest court order acquitting Sajjan Kumar in 1984 Sikh riot case is something which has dented our faith in our judiciary. As unbelievable as it can get, the courts (that too lower) took close to thirty years to figure out how innocent Sajjan Kumar was all this while. I pity, both on our judiciary, our investigative agencies and the thousands of Sikhs who suffered in the hands of the skunks like Sajjan Kumar. As if losing your dear ones weren’t a great pain itself, the hapless relatives were subjected to a long and tiring fight of 30 years for justice. And what they get at the end of this long fight? Absolutely nothing. A person whom they have seen instigating mobs to kill Sikhs in exchange of cash reward; a person against whom they have testified with abhorrence is set free by our courts. What they have seen in their own eyes or what they have suffered because of Sajjan Kumar hold no fortitude for our courts to look in and provide that much needed healing touch. I pity on our entire criminal justice system altogether. Whom to blame for this sabotage of justice? I don’t blame our judiciary entirely, for they decide based upon whatever they are fed with as proof and certainly it is not the job of our courts to dig out truth from the rumbles. It is the job of our investigative agencies like CBI to take care of this most important cog of our justice system. Looking at the latest statement of CBI boss, the last thing we can expect from CBI is some investigation free from political interference. And it is no secret who or which political party stands as a beneficiary from the shoddy outcome of Sajjan Kumar’s trail. A government which could very well be the most corrupt of its kind since we gained independence; buried neck deep in scams and corruption activities could certainly be better off without answering uncomfortable questions about one of their own, had the court decision indicted Sajjan Kumar the wrong way. It could have been a triple whammy for the spokespersons of Congress party when they allready are clueless on how to manage the avalanches in the form of Sarabjit Singh and unauthorized Chinese incursion. To add to the self-infected woes, the recent reopening of Jagdish Taytler’s case on 1984 genocide hasn’t helped the nefarious interest of Congress party at all. But what about the victims and their families? What about those who saw and testified Sajjan Kumar leading a mob and asking them to kill Sikhs with cash reward of Rs 1000/- per Sikh head? What about the statements like ‘Ek bhi Sardar nehin bachna chahiye’ enchanted by Sajjan Kumar while instigating the rowdy mob? How could the courts overlook such incriminating evidence against a person who no way deserves any kind of leniency? How the words of those who suffered and know precisely about their oppressor, could so easily be sidelined? I blame this on CBI and other investigative agencies, which also includes the Delhi police. Systematically these two institutions tried their best to weaken the case so that their political bosses in Congress could enjoy a continued stress free life. Looking at the number of times CBI tried to file closer reports on Sajjan Kumar and Jagdish Tytler’s case, it wonders me if CBI was pressed into service to unearth the truth and apprehend the bastards or find excuses to close the case. Even the particular case where Sajjan Kumar was let off while five others were convicted sounds more like an organized mishandling of truth than justice. On the basis of the same witness, who testified against SK and the other five; while SK was termed a holy cow, the rest five were sentenced. How is that possible when the words of witnesses nails five people but fails to convince the court about a particular political idiot, for the same crime? It bewilders me to even imagine the semantics of our lower court’s modus operandi since they even choose to ignore the 2012 statement of CBI where it has accused Sajjan Kumar squarely for instigating a mob to butcher innocent Sikhs. How it is conveniently covered up when people not only have heard SK shouting ‘whoever kills the sons of the snakes would get reward from me’ but also have testified the same in the courts? Don’t our courts value the words of the oppressed but agrees to take sides of morons like Sajjan Kumar just because they are politically well connected? What about the details of November 1 when Sajjan Kumar hold three consecutive rallies in as many hours and led a mob from Palam to Mangolpuri, all the while shouting ‘Kill the Sardars and Indira Gandhi is our mother and these people have killed her’? Why the courts choose to ignore the arguments of the CBI prosecutor where he has stamped the possible accomplishment of Sajjan Kumar in 84 riots? Why no steps were taken to set these Delhi police goons straight since they are also accused of keeping mum as the whole genocide was planned by the rogues of Congress party? What about even the chilling details of the manner in which senior Congress men were distributing Kerosene to the mob? Why a certain Brahmanand Gupta, president of the A-4 Block Congress and his role in distributing the inflammable never taken into consideration? How is this possible that none has given a serious thought about this rascal Gupta and his notorious role in supplying potential fatal armory to the irate crowd? The entire thing looks shoddy. The more I study about 84 riots, the more I feel dejected about the nonexistence of justice in our country. A peace loving community was attacked, killed, their women raped, children orphaned and yet after 30 years we are setting free one moron after another from the accused list. Had there been lack of evidence, the verdict of the courts could have been taken as the outcome of fate but to surprise all, the rogues are been let lose after having incriminating evidence of them being more than just instigators. Disparaging sounds such an understatement here. A party which sheds gallons of crocodile tears for the so called minorities conveniently forgot to note that Sikhs also belong to the same minority community. While they are head-over-heels in shouting for justice for the Gujarat riot victims, they are defending and covering up their own people who are accused of more serious minority atrocity. Hang Modi remains the motto of Congress while they go ahead honoring Rajiv Gandhi with Bharat Ratna for reacting with ‘when a big tree falls, earth shakes’, when asked about the Sikh genocide. And shame on Manmohan Singh for being a party to the interest of this grossly inept, corrupt and self-serving lot. He himself being a Sardar must introspect about his contribution to heal the wounds of his own brothers and sisters from his own community. If he can't or intentionall don't want to then what could be said about a person who can actively conspire to backstab his own people? Can we expect him to carry any notion in doing justice to the rest of the nation? Perhaps not. I am sorry to say this but I am beginning to hate being called an Indian. I hate to be part of a country where justice is as far from the oppressed as is sanity from our political class. And I am told we are the biggest and most vibrant democracy of the globe. Aren’t we? Flabbergasting!! You have just told what lakhs/ millions are thinking. There is no mincing of words and the clear feeling comes out in the form of words, even if abuses. But who bothers for a common man's feelings? The rogues ruling the country are shameless and are not bothered of these spittings. The first outburst by way of throwing a shoe at the judge shows the common man's feelings and his arrest shows the shameless ones' behaviour. Even if nobody bothers, let us keep talking straight; sometime may come when people start listening what we say. One question for Rashid Alvi of congress: Bhainse pe kaun savar tha jab sikhon ka katl kiya ja raha tha? Sikhs should never expect justice from a totally rotten and corrupt System.